I don’t do many DVD or Blu-Ray commentary tracks anymore, in part because fewer are being produced. But when the nice folks at Twilight Time call, I usually participate. First, because Nick Redman and Julie Kirgo are such fun partners in front of the microphones, always so informed and prepared; and second, because they often are looking for a bit more depth on the composers and scores. 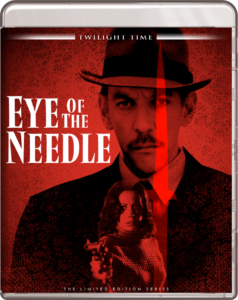 In the case of Eye of the Needle, the 1981 thriller starring Donald Sutherland and Kate Nelligan, I enjoyed talking about composer Miklos Rozsa and one of his last feature-film scores.